The 20th annual North American Open chess tournament was held December 26-29 at Bally’s Casino Resort in Las Vegas. The seven round event with 670 players was divided into seven sections. Giorgi Kacheishivili, originally from the Republic of Georgia now living in New York, and Jiri Stocek, Czech Republic, topped the Open section of 131 players with 6-1 scores. Like a phoenix I returned from a disastrous 0-2 start in the Under 1900 section to win three games and draw two, finishing close to my expected norm with 4 points. While I have played in 49 chess tournaments since 1991, one of my opponents, with whom I drew, has played in 352. My youngest opponent, currently the 27th best 10 year old chess player in the U.S., played more book moves in the King’s Gambit but lost after he exchanged a pawn in the middle of the board which opened a file and long diagonal. My last round draw found me better after the opening but losing the thread of the game (and a bishop) in the middle game. I almost resigned. A passed pawn kept me in the game and when my opponent won one of my pawns I was able to win back the bishop. The resulting Rook and pawn ending will provide me with an opportunity to for further study. Congratulations to Mohammad Yousef, Florida, who received $8,000 for winning the section with an impressive 6.5-0.5 record. A major chess tournament such as this one is a great opportunity to play opponents at a similar skill level. Bally’s, centrally located on the Strip, offered a low daily rate but no in-room coffee or free wi-fi. The dancing water on the 8-acre lake in front of the Ballatio entertained us in lieu of a show. Neon lights still decorate the night as crowds slowly stroll the sidewalk. New street entertainers vie for tips. Two African American entertainers crooned Temptation tunes in the Hawaiian open air pavilion. The food was generally very good, if pricey. Buffets are more expensive than in the old days and long waits to be seated are the norm. As we departed, Las Vegas was warmly bracing to bring in the New Year. Our return drive took much longer than anticipated because a snow storm passed through the previous day leaving some roads closed. In fact, I40 opened just as we arrived at what had been its detour junction. In many spots only one lane was clear. Later, 89A, which had also been closed, was snow packed at the higher elevations. Fortunately, our Lexus RX350 had no trouble navigating the snow and ice. 2010 has been a great year. Here’s to a Happy New Year! A visit to the Phoenix Art Museum provided an opportunity to savor the inspiration of creative minds. Exploring the current exhibits on Christmas Eve avoided the masses at the mall scrambling to find those final presents. “Brett Weston and Sonya Noskowiak: Inspired Vision,” the current photographic collaborative exhibition with the Center for Creative Photography at the University of Arizona, features two photographers mentored by Edward Weston. The landscape compositions of Brett Weston, such as his sand dune photographs, use an artistry of curves bound by shade to reveal a richly detailed abstraction. The Museum’s American, Western American, Spanish Colonial, European, Asian Art, and Thorne Miniature Room Galleries are closed for renovation. “The Long 19th Century, 1789-1914” exhibit makes representative work from the closed galleries available for view. Of special note, three pieces on exhibit are on loan from Camelback High School. Apparently the senior class gifts during the 1960s were determined to be works of fine art. An interesting story. “Extending the Runway” features awe inspiring high fashion dresses. Unusual fabrics augmented by color, pearls, or feathers make any occasion such a dress is worn special. The Phoenix Art Museum has an unusually strong modern art collection and large spaces to properly show such pieces. 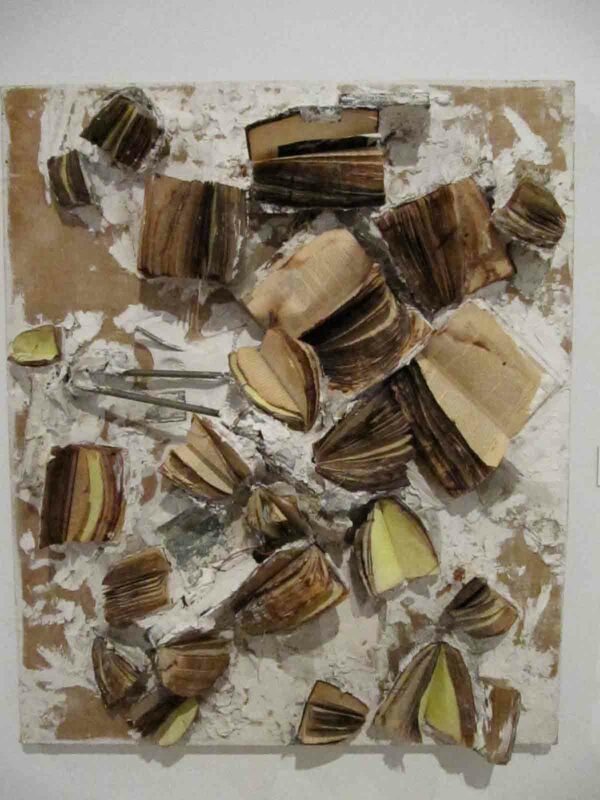 John Latham’s “Buffie,” a collage from books, metal, and plaster, raises interesting questions. Torben Giehler’s “Tomorrow World,” Al Held’s “Pisa II,” and Peter Saul’s “Nightwatch” use vibrant colors. Robert Arneson’s “Stream-a-Head” uses terra cotta and glazed ceramic. Jennifer Steinkamp’s “Mike Kelley13” is a fascinating, ever changing digital projection of a tree changing with the seasons. Finally, It is always fun to move through Yayoi Kasama’s “You Who Are Getting Obliterated in the Dancing Swarm of Fireflies” which uses LED lights and mirrors in an otherwise dark room. The Desert Botanical Garden (DBG) hosts Las Noches de las Luminarias each year during the Christmas holiday season. We attended for the first time last night, and we were not disappointed. When we arrived around 5:30 p.m., the sunset filled the sky with color, enhanced by the desert landscape and nearby Papago Park rock formations. Upon entering the illuminated DBG grounds we were attracted to the sounds of jazz renditions of Christmas tunes by the Swingtips. After listening to two or three songs, we decided to see whether there was a wait for the buffet dinner. There wasn’t although the indoor seating was more limited than outdoors. We augmented our open air dinner experience under a heater with a bottle of wine and enjoyed the New Orleans jazz and blues of the Bad Cactus Brass Band. Meridith Moore and Mike Lander joined them for a couple of songs, on one of which Landers did a great impersonation of Louis Armstrong. The variety and quality of musicians at this event are definitely worth the price of admission. The a capella vocals and period costumes of the Dickens Carolers put us in the holiday spirit. Likewise, the Scottsdale handbell choir, Camanillas del Sol, performed in a professional manner. We also enjoyed the Scott Jeffers & Traveler which featured virtuoso violin playing and the flamenco guitar from the Chris Burton Jácome Ensemble. The Huney Brown Show Band displayed a lot of soul. Vocalist Teresa Hunt is a crowd pleaser and the lead guitar, the only white member of this group, played some terrific riffs. If you attend this special event be sure to seek out the performers off the beaten track. One of those, Will Clipman, is a gifted performer of world music and a poet. His description of the Swiss Hang, for example, was very interesting. Ken Duncan, an Apache storyteller, used his voice and gestures to share how the Salt River got its salt. 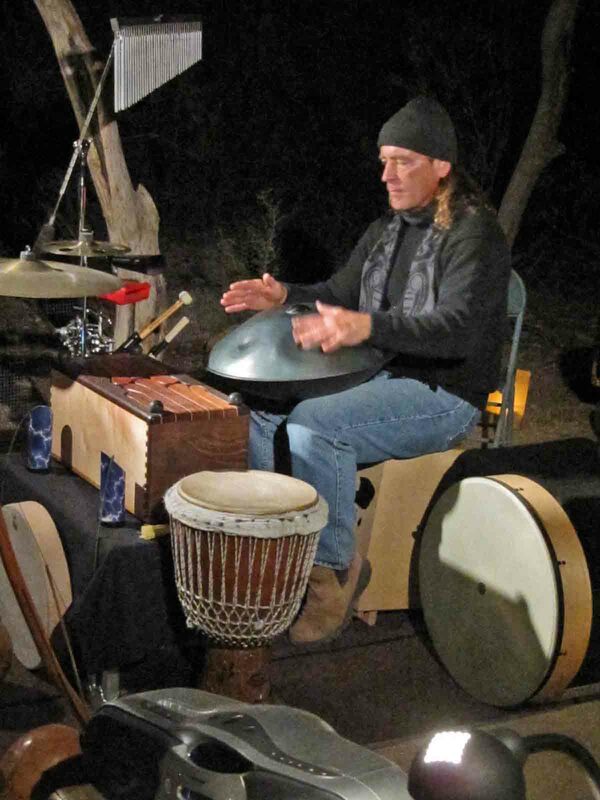 The Desert Botanical Garden hosts an illuminating event with a musical buffet not to be missed. 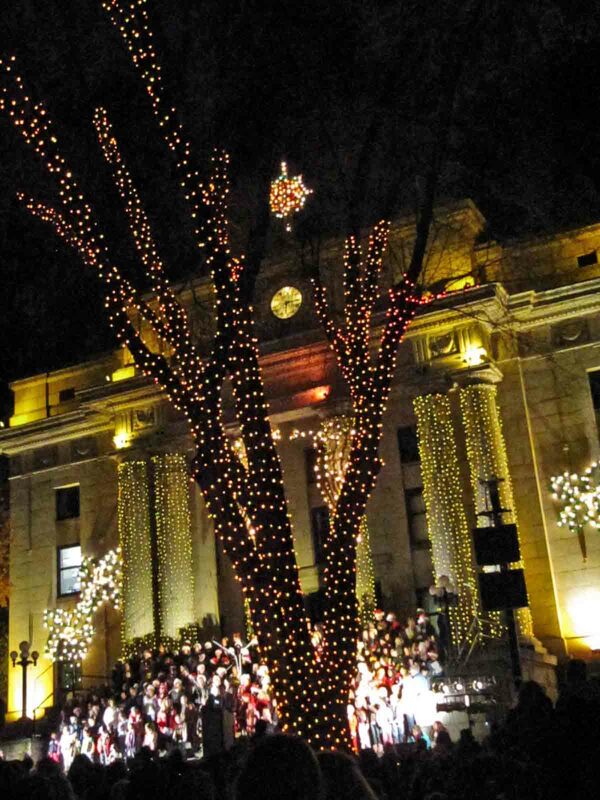 Prescott is acknowledged as Arizona’s Christmas City and takes its title seriously. 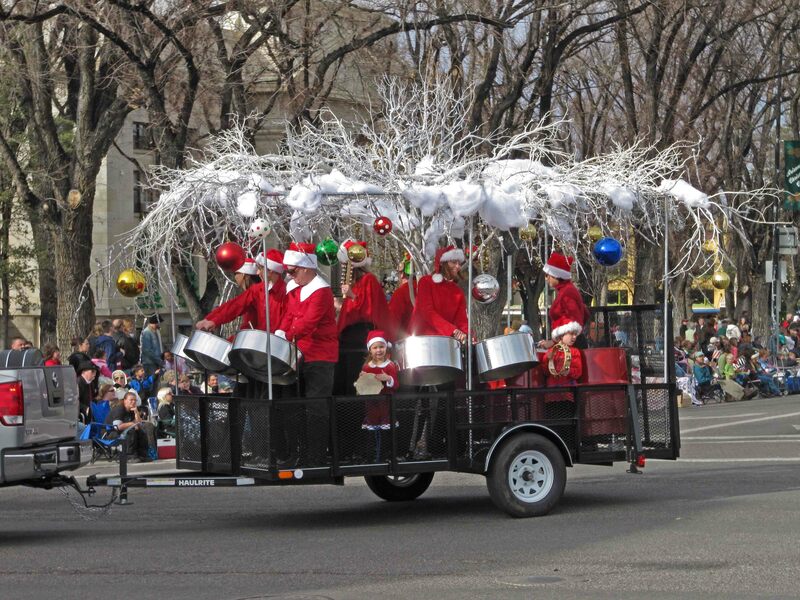 This past Saturday the 28th annual Christmas Parade started at 1 p.m. and lasted until a little after 3:30 p.m. The weather was fine and we enjoyed the parade from the corner of Cortez and Goodwin. “The Bells of Christmas” theme was embodied in 111 entries representing automobile clubs, bands (including Catalina Foothills from Tucson), owners of various breeds of dogs (especially enjoyed the Scotties with their festive outfits), local businesses (Fry’s grocery had an impressive prize winning float), churches, area clubs and organizations, and representatives of branches of the military (the Coast Guard, however, seems out of place in this part of the world). Women in Victorian dresses and men in Western garb bring visions of the area’s history to life. The Pandemonium Steel Drum Band received the Grand Award. In an effort to avoid the traffic we headed to the Prescott Resort and Conference Center whose lobby displays a Gingerbread Village with more than 100 whimsical structures. There is an amazing amount of creativity poured into these miniature works of edible art. Donations support the Yavapai Big Brother/Big Sister program. A model train weaves its way through the main exhibit and additional model trains can be seen in an adjacent room. A very large crowd gathered later in the day around the Yavapai County Courthouse for the 56th annual Courthouse Plaza lighting. From the Courthouse steps the Prescott High School Show Choir entertained the growing throngs prior to the main event. Shortly before 6 p.m. they were replaced with children of all ages who formed a choir for this special event. Ken Bennett, Secretary of State, read a rendition of the first Christmas interspersed with appropriate Christmas carols. At 6:15 p.m. the lights came on to illuminate the grounds. A visit on a less crowded night may be necessary to appreciate the decorative lighting. Prescott is now ready to celebrate another Christmas.